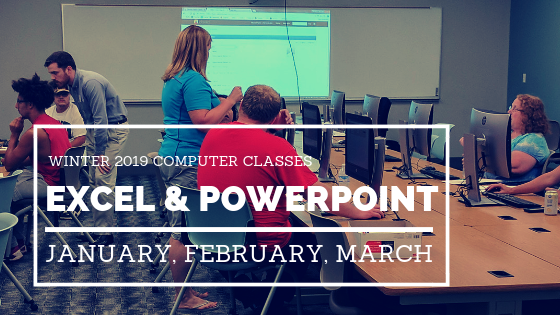 Dates have just been announced for Winter 2019 Computer Classes at the Fostoria Learning Center. These classes include basic Excel training and a half-day PowerPoint workshop. Excel classes take the form of one-day workshops running on Thursdays from 9:00am-4:30pm (see schedule below). There are Excel basics and intermediate level training and a PowerPoint training for the user who has some PowerPoint knowledge, but is ready to WOW their audience with their presentations. For those students who don’t have time for a full day class there is an Excel Basics, which is an accelerated program run over two consecutive weeks during the evening hours. Due to high interest and limited computers, class size has been capped at 14. Custom Training Solutions, a division of Northwest State Community College is running these classes at the Fostoria Learning Center. Note: Registrations close 2 business days prior to class date. Classes must have a minimum of 4 people to run.